Identification. San Marino takes its name from its founder, Marinus, who according to legend founded the republic in 301 C.E. San Marino is comprised of native Sammarinese and Italian citizens. Although Italian-speaking and heavily influenced by the surrounding Italian culture, the Sammarinese have maintained their individuality through the centuries, have a strong sense of identity, and are proud of their unique culture. Location and Geography. San Marino, one of the smallest republics in the world, is located in the Emilia-Romagna region of Italy, south of the city of Rimini on the northern part of the Adriatic coast. Approximately 24 square miles (61 square kilometers) in size, San Marino is completely landlocked. Situated in the central part of the Apennine mountains, San Marino is dominated by the three-peaked Mount Titano, which is 2,437 feet (743 meters) high. There are several streams and small rivers, including the Ausa, Marano, and the San Marino. The terrain is rugged but the climate is Mediterranean with mild to cool winters and warm, sunny summers. The capital is located in the main town, also called San Marino. Other important towns include Serravalle, Borgo Maggiore, and Domagnano. Demography. A 1997 survey put the population of San Marino at 24,714 of which 14 percent are were fourteen years old and younger, 68 percent were between fifteen and sixty-four years old, and 18 percent were sixty-five years old and over. The population is divided ethnically between Sammarinese and Italians. San Marino is one of the most densely populated countries in the world with an average of more than 860 people per square mile (332 per square kilometers). The republic is approximately 5.5 miles (9 kilometers) across and 8 miles (13 kilometers) long. It is estimated that sixteen thousand Sammarinese live in other countries. Linguistic Affiliation. The official number of languages spoken in San Marino is two: a Sammarinese dialect and standard Italian. Approximately 83 percent of the population speak Sammarinese, which is considered a variation of the Emiliano-Romagnolo dialect found in the surrounding Italian region. Standard Italian is the language of everyday use, although typical Sammarinese phrases and expressions are used regularly. Symbolism. The Sammarinese flag consists of two equal bands of white (above) and light blue (below) with the national coat of arms placed in the center. The coat of arms features a shield with three towers on three peaks flanked by a wreath, with a crown above and a scroll below bearing the word Libertas (Liberty). The towers represent the three fortified towers on Mount Titano which have been strategic in the defense of the republic throughout its history. The national holiday is 3 September, the Anniversary of the Foundation of the Republic. then the Community of San Marino, and finally the Republic of San Marino. The state of San Marino maintained its independence despite frequent invasions by the rulers of Rimini, and in 1291 Pope Nicholas IV recognized San Marino's independence. 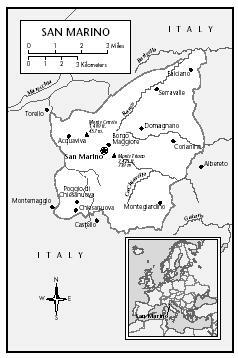 The territory of San Marino consisted only of Mount Titano until 1463 when the republic formed an alliance against Sigismondo Pandolfo Malatesta, Lord of Rimini, who was later defeated. As a reward, Pope Pius II gave San Marino the towns of Fiorentino, Montegiardino, and Serravalle. In the same year the town of Faetano voluntarily joined the young state. The nation has remained the same size ever since. San Marino has been occupied by invaders only twice, both for short periods of time. In 1503 Cesare Borgia, known as Duca Valentino, occupied the country until his the death of his father Rodrigo Borgia, Pope Alexander VI, the same year. The political unrest following the Pope's death forced Cesare Borgia to withdraw his forces from San Marino. In 1739 Cardinal Alberoni, in an attempt to gain more political power, used military force to occupy San Marino but civil disobedience and clandestine communications with the current Pope, Clement XII, helped to ensure recognition of San Marino's rights and restoration of its independence. Since 1862 San Marino has had an official treaty of friendship, revised several times, with Italy. National Identity. The Sammarinese are proud of their history and have a strong sense of unity due to San Marino's small size and unique place in the world. Ethnic Relations. There is a large resident Italian population in the republic, and contact with the surrounding Italian regions have helped ensure close cultural and ethnic ties between the Sammarinese and the Italians. Although there is a free flow of people in and out of San Marino, it is extremely difficult to acquire citizenship. A person can become a citizen only by being born in the republic, and only if both parents are citizens; or by marrying a Sammarinese. Citizenship through naturalization is rare. As a consequence, San Marino has a population that is still almost exclusively native Sammarinese. San Marino is a mountainous nation consisting of small hill towns. Stone, brick, and tile are some of the principal building materials and like many Italian towns, the center of town is piazza which also serves a social function as a gathering place. The capital, the City of San Marino, is a fortified town as are many of the other towns of San Marino. Much of the original medieval fortifications remain, including three fortified towers located on the peaks of Mount Titano. These towers, called La Guaita, La Cesta, and Il Montale, are still linked by ramparts and walls constructed from the local sandstone. The oldest part of the capital dates from the early twelfth century. In the older sections of San Marino there are still many buildings dating from the Renaissance period in the early 1400s. Food in Daily Life. Food and meals are an important part of life in San Marino. The cuisine is Mediterranean, emphasizing fresh and locally grown produce, pasta, and meat. Although it is similar to that of the Italian Romagna region which borders San Marino, the cuisine of San Marino features its own typical dishes. Traditional recipes include faggioli con le cotiche, a dark bean soup flavored with bacon and traditionally prepared at Christmas; pasta e cece, a soup of chickpeas and noodles flavored with garlic and rosemary; and nidi di rondine (literally, "swallow's nest"), a dish of pasta with smoked ham, cheese, beef, and a tomato sauce, which is then covered with a white sauce and baked in the oven. Roast rabbit with fennel is also a popular Sammarinese dish. Other popular local dishes include bustrengo, a cake made with raisins; cacciatello, a mixture of milk and eggs; and zuppa di ciliege, cherries stewed in red wine and sugar and served on local bread. San Marino also produces high quality wines, the most famous of which are the Sangiovese, a strong red wine; and the Biancale, a dry white wine. There are many small family-owned restaurants, often providing outdoor seating in the summer, which play an important role in the lives of the Sammarinese, as meals are a daily part of family life and socializing. Basic Economy. Tourism is one of the most important parts of San Marino's economy and many businesses cater to the tourist trade. The sale of collectible postage stamps and coins also constitutes a major part of the republic's revenue. Until the latter part of the twentieth century, farming, mining, and stone working formed the core of San Marino's economy. White sandstone was once abundant but most of the quarries are now closed. Sandstone is now extracted in limited quantities for decorative and artistic purposes rather than for construction. In addition to wine, the production and export of alcoholic spirits and liqueurs is a significant industry, along with other agricultural products such as wheat, grapes, corn, olives, cattle, pigs, horses, beef, cheese, and hides. Although San Marino still has a strong agricultural sector, it is dependent on imports from Italy in order to meet all of its needs. San Marino's standard of living is high with an average per capita yearly income of about $32,000 (U.S.). San Marino's GDP is around $500 million (U.S.) annually with the rate of inflation at 2.2 percent. Unofficial estimates put the GDP growth rate at 8 percent. Land Tenure and Property. Approximately 65 percent of San Marino is covered by farmland and pine forests with the rest consisting of parks, public spaces and buildings. Both private and public ownership of property exists in the republic. Commercial Activities. The tourist sector generates more than 50 percent of the gross domestic product (GDP) of San Marino, with an average of 3.2 million tourists visiting the republic San Marino every year. Small businesses such as souvenir shops and restaurants depend heavily on tourism. Other important commercial activities include the sale of historic coins and postage stamps. In 1894 San Marino issued the first commemorative stamps which have been an important source of income for the republic ever since. Major Industries. Important industries include banking and the manufacturing of clothing, electronics, paint, synthetic rubber, telecommunications equipment, and ceramics. Important export products include building stone, lime, wood, chestnuts, wheat, wine, baked goods, hides, and ceramics. San Marino's main trading partner is Italy, accounting for 85 percent of exports. Agricultural products and consumer goods are imported from Italy, eastern Europe, South America, China and Taiwan. Trade. Italy is San Marino's major trading partner. Trade statistics are included with those for Italy. Division of Labor. According to a 1998 study, the workforce of San Marino was divided as follows: 4,254 (25 percent) worked in the broad public sector; 5,637 (34 percent) worked in industry; 3,140 (16.5 percent) worked in the commercial sector; 1,492 (9.1 percent) worked in construction; 505 (2.7 percent) worked in banking and insurance; 355 (2.1 percent) worked in transportation and communications; 248 (1.6 percent) were involved in agriculture; 1,779 (9.3 percent) worked in a variety of businesses and services. The unemployment rate is around 2 percent. Recent figures place the unemployment rate at about 2.2 percent for women and at 1.8 percent for men. Classes and Castes. San Marino's small population and high standard of living have helped ensure a relatively balanced distribution of wealth. The government maintains a policy of full employment for all its citizens and works with the private sector to ensure that all Sammarinese who wish to work are employed. San Marino's small size, power-sharing government, high standard of living, and educated population have made it a country with very little social stratification. 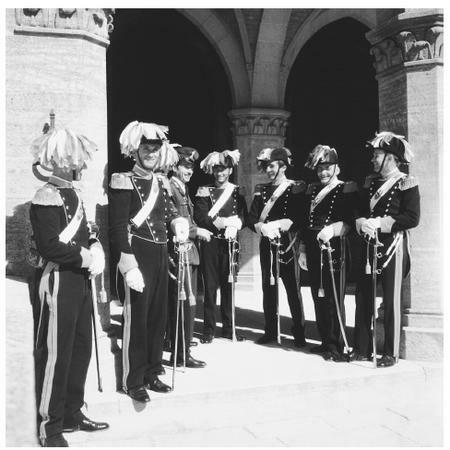 Uniformed guards in San Marino. The country is neutral and has no military nor any alliances with other countries. Government. Created in the early Middle Ages, the original governing body was the Arengo, made up of the heads of each family. Today the Arengo is the electoral body, while the main governing body is the Great and General Council. In 1243, the first two captains regent were nominated by the council and this system has continued to this day. The council is composed of sixty members who are elected every five years under a proportional representation system. The duties of the Council consist of approving the budget and nominating the captains regent and heads of the executive. Every six months, the council elects two captains regent to be heads of state for a six-month term. The regents are chosen from opposing parties in order to provide a balance of power. The investiture of the captains regent takes place on 1 April and 1 October every year. Once a regent's term is completed, citizens have three days to file any complaints about the regent's activities. If warranted, judicial proceedings against the ex-head of state may be initiated. Executive power is held by the State Congress, which is composed of three secretaries and seven ministries. The Council of Twelve is elected by the Great and General Council for the duration of the legislature and serves as a jurisdictional body as well as a court of appeals. Two government officials represent the state in financial and patrimonial matters. The judicial system of San Marino is entrusted to foreign executives for both historical and social reasons. The only Sammarinese judges are the justices of the peace, who handle only civil cases where sums do not exceed 25 million lire (around $16,000 [U.S.]). Leadership and Political Officials. San Marino is a democratic republic with several political parties. The three main parties are the Democratic Christian Party of San Marino, the Socialist Party of San Marino, and the Progressive Democratic Party of San Marino; there are several other smaller parties. Because of San Marino's small size and population, it is difficult for any one party to gain a pure majority, and most of the time the government is ruled by a coalition. The current parties in power are the Democratic Christian Party and the Socialist Party. Social Problems and Control. San Marino faces economic and administrative problems related to its status as a close financial and trading partner with Italy while at the same time remaining separated from the European Union. Another important issue facing the government is improving relations among the parliament, the cabinet, and the captains regent. Military Activity. San Marino is officially neutral and does not have an army or any alliances with other nations. The last battle in which San Marino actively participated was in 1463. The republic has been invaded and occupied several times since then but has always maintained its position of neutrality. There is a symbolic military force of eighty men who participate in San Marino's ceremonial events and occasionally assist the police. In a time of crisis, however, the government can call all adult males to arms as happened during World War II when San Marino was directly involved in the war as the target of heavy bombing and as a haven for thousands of refugees. The Institute for Health and Social Security, a public organization that is independently managed, provides health care, social services, and social security. San Marino provides cradle-to-grave health care for all its citizens as well as retirement pensions. The Relative Status of Women and Men. In San Marino today, women have most of the social and political rights that men have. Women received the right to vote in 1960 and the right to hold office in 1973. The first female captains regent were elected shortly thereafter. Nevertheless, slightly more men than women receive some form of higher education, and the unemployment rate is higher for women as well. These differences are in part due to the changing role of women in San Marino and the transition the republic has undergone in the late twentieth century, as its economy has moved away from agriculture and deemphasized industrialization. Domestic Unit. In a small and unified country like San Marino, family plays an important role. Extended family and kin are an important part of the social structure of the republic. With the transition from an agricultural to a more industrialized economy following World War II, the nuclear family has replaced the extended family as the basic domestic unit. There are approximately eight marriages per one thousand and the divorce rate is relatively low. If they are no longer able to care for themselves, older family members usually live with their younger relatives. Children often continue to live at home with their parents well into adulthood, until higher education is completed or they start their own families. Infant Care. Public day care and nursery schools are available for children under the age of five. Child Rearing and Education. The school system in San Marino is very similar to that in Italy and is obligatory until the age of sixteen. Children attend state-run primary and secondary schools, choosing a particular type of school when they reach the high school level. Higher Education. There are no universities or colleges in San Marino and those students who decide to pursue higher education usually attend university in Italy where San Marino's high school diplomas are recognized. 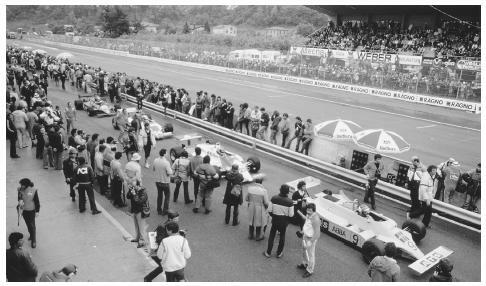 Formula One cars in the Imola Grand Prix. Standards of etiquette are similar to those in Italy. Due to the important tourist industry, the Sammarinese are accustomed to welcoming people from all over the world. Religious Beliefs. The predominant religion, Roman Catholicism, is still regarded as the principal religion. Historically, the Sammarinese have been against the Vatican's political control over their republic but have embraced the pope's spiritual authority on religious matters. The importance of Catholicism in San Marino has led to the involvement of the church in many state occasions; many of San Marino's official ceremonies are held in the Basilica, the republic's main church, or in other churches. There are a total of nine Catholic parishes all of which comprise the diocese of San Marino. Religious Practitioners. There is no official state religion but practitioners of Roman Catholicism predominate. There are no figures available for the number of non-Catholic practitioners. Rituals and Holy Places. The Basilica dates from the fourteenth century and contains the remains of Saint Marino. San Marino is able to provide low-cost health care for its citizens through clinics and a small hospital. Although the level of care is high, for certain types of health care the Sammarinese must turn to hospitals outside of the republic. The average life expectancy is placed at seventy-seven for men and eighty-five for women. The Sammarinese birthrate is around 11 births per 1,000 people, while the infant mortality is rate 3 out of every 1,000 births. There are five official national festivals in San Marino all of which celebrate important events in the republic's history: 5 February, the anniversary of the republic's liberation from the occupying forces of Cardinal Alberoni in 1740; 25 March marks the day in 1906 when the Arengo implemented the democratic form of government that exists today; 1 April and 1 October, the two days when the captains regent take office; and 3 September, the feast day of the patron saint and founder of the republic, Saint Marino. Support for the Arts. The Sammarinese proudly support and maintain several small museums as well as take an active interest in cultural activities including film, music, and literature. Graphic Arts. San Marino's long history and extended periods of peace have endowed it with a substantial artistic legacy including paintings by several important Italian artists from the Renaissance and Baroque periods. There are also numerous sculptures placed throughout public spaces. Traditional crafts, such as stone carving and ceramics, have been able to survive in part from the tourist industry. San Marino's small population and its lack of a university means that it is not able to support academic research at the postsecondary level. Many Sammarinese, however, go on to pursue successful careers in academia and research outside the republic. Cardinali, Marino. San Marino e la sua Storia, (San Marino and its history), 1982. Carrick, Noel. San Marino, 1988. Edwards, Adrian. San Marino, 1996. Grimes, Barbara. Ethnologue, 13th ed., 1996. Ricci, Corrado. La Repubblica di San Marino (The Republic of San Marino), 1906. Rogatnick, Joseph H. "Little States in a World of Powers: A Study of Conduct of Foreign Affairs by Andorra, Lichtenstein, Monaco, and San Marino," Ph.D. dissertation, University of Pennsylvania, 1976.
do you guys have the ethnic clothes for san marino i have to do this for a big social studies project thats coming up for school. thanks to this article i have everything i need for my research project for geography. couldnt ask for more. Great Job!!! Thanks a bunch for this info! I needed it for mi 9th grade geography prpgect and had no clue. But what is tha regilion with the most percentage? I could not find it! Hey i want to know the economic problems that san marino faces. CAN ANYONE HELP ME WITH THE LIFE EXPECTANCY AVERAGE IN SAN MARINO? WHY IS IT SO HIGH? Hey i just wanted to know that what is the Human Interaction in San Marino. I have a project to do so that is why i need to know all the facts about san marino! I lopked on all websttes and i didn't find anything! So can u please tel me the human interaction of san marino? I think you need some pictures of their traditional clothing. Does San Marino have a genealogy site I could look up for father's history and his family? I was in san marino and i saw a lot of mythological sculptures selling as a souvenir. I cannot find anywhere why is that a souvenir. I cannot fing nothing about the legends at all... Can someody help?! can someone help with San Marino's export i need this for a big olympics project please help me i don't wanna get an f!